The essence of Organizational Citizenship Behavior (OCB) has now been considered as a sustainable source of competitive advantage and especially in start - ups . These papers aims at to exploring how different factors influencing on developing employee’s citizenship behavior and effect the viability of new ventures . Additionally, it examines the mediating impact of stress in the relationship between entrepreneurial leadership and OCB. Thi s paper adopted survey questionnaire to collect data from the employees working in newly established entrepreneurial ventures in Iraq by randomly distributing 5 92 questionnaires and received 359 completely answered questionnaires. The Partial Least Square S tructural Equation M odeling (PLS - SEM) was utilized to examine the direct and mediating effects. The results of data analysis reveal the negative significant effect of entrepreneurial leadership and stress on developing organizational citizenship behavior in entrepreneurial ventures in Iraq . The study has some useful aspects for the academic researchers to further explore the examined phenomenon in different contexts . The findings of this paper are also helpful for the entrepreneurs and policy makers espec ially for the SMEs sector in Iraq . Entrepreneurial Leadership, Entrepreneurial Ventures, Organizational Citizenship Behavior, Employees Stress. Existence of human beings and survival in the environment naturally depend on the enterprises’ subsistence and ability to cope with various stakeholders’ requirements towards structural, economic, communal and environmental intergenerational equity (Chowdhury, 2013). Though, conflicts at organizational, economic and environmental level have impacted effective implementation of sustainability measures in organizations. The organizational citizenship has now been considered to resolve such conflicts and benefit, viable and responsible for future enterprises. Moreover, sustainable performance in organizations further requires the proactive and creative competence towards fulfilling multiple stakeholders’ needs and expectations. These requirements, therefore, need that organizations should have endogenous ability to resolve conflict at organizational and societal, and financial and environmental level. This reference of sustainability performance is holistic in nature and takes organizational, societal, economic and environmental equity into context. In organizations, the essence of Organizational Citizenship Behavior (OCB) is a critical indicator to assess employee’s commitment with job and ultimately leads to satisfaction (Faisal et al., 2016; Shabbir, 2009; Jafari et al., 2011; Shabbir et al., 2018). Organizational citizenship behavior can be described as an individual’s discretionary behavior that neither is nor directed by his or her organization and neither the part of his or her official reward mechanism. Employees with organizational citizenship behavior are generally perceived as high performer and receive quite better rewards than others (Alkahtani, 2015). Similarly, Entrepreneurial Leadership (EL) also considers as an important factor that enables an organization to response in volatile environment and works for the enterprise’s effectiveness (Sani & Maharani, 2012). Generally, entrepreneurial leadership concept is not as simple as performance, nevertheless, it is a social process by which entrepreneur regulates others improve their capacities to achieve organizational goals (Kruse, 2013). Leader inspires the individuals working around by directing them to complete the tasks and motivates them to perform better. Consequently, it has a great influence on employee’s behavior and their actions (Sharafi & Rajiani, 2013). Correspondingly, entrepreneurial leadership can also develop Organizational Citizenship Behavior (OCB) among employees by leveraging contingent rewards and considering employee’s performance to nurture organizational citizenship behavior among working employees (Ali & Waqar, 2013). Preceding studies demonstrated that entrepreneurial leadership has a positive impact over OCB of employees (Podsakoff et al., 2000; Lian & Tui, 2012; Suliman & Al Obaidli, 2013; Rodrigues & Ferreira, 2015). Some studies, however, reported that EL indicated weak and insignificant impact on OCB (Ali & Waqar, 2013). The contradictions of results, therefore, make the impact of entrepreneurial leadership ambiguous. These ambiguities at work place play the role of stressors. Additionally, it is evident that stress has a negative impact on employee’s work performance as well as on OCB. Likewise, limited access to needed information increases stress and reduces OCB (Eatough et al., 2011). Entrepreneurial leadership, at some also extent may cause stress in employees (Sherman, et al., 2012). High level of stress in organization decreases the support’s effect and leads to the employee’s negative interactions regarding OCB (Jain et al., 2012). Individual consideration is considered as a strong element of transformational entrepreneurial leadership, to reduce the stress. The controversies and inconsistencies in the literature, therefore, provide justifications to further explore the antecedents of OCB and their possible impacts. Keeping in view the preceding research on OCB, the present study considers the mediating role of stress between entrepreneurial leadership behavior and OCB on the relationship between EL and OCB in entrepreneurial ventures in Iraq. A thorough review of the literature perhaps guides that this combined effect of EL, OCB, and stress is scarce, especially in the entrepreneurial ventures and start-ups, which advocates addressing this gap in the body of existing knowledge. The study was, therefore, conducted to examine the mediating role of stress on the relationship between EL and OCB of newly established ventures’ employees. Organizations do not punish their employee who does not exhibit OCB (Podsakoff et al., 2000). OCB is a behavior which employees perform with their own choice without any pressure of supervisors and this extra role behavior is very essential for the sustainability of organization especially for start-ups (AlKerdawy, 2014). In recent literature theorists argued that productivity of an organization increase as much as the employees are involved in OCB. OCB is crucial to retain the employees with organization. Saif-Ud-Din & Adeel (2016); Jafari & Bidarian (2012) revealed that organizational justice and OCB of employees are directly correlated with each other. Additionally, Leader’s fair behaviors to treat employees, direct the employees to perform OCB. Those employees who see that their leader treats them fairly are more engaged to OCB (Williams et al., 2002). Ahmed et al. (2011) conducted a study on financial sector employee of Pakistan and examined the relatioship between fairness of appraisal in performance and OCB with ogganizational commitment as a mediator. They stated that fair treatment of supervisors in organization is much contributive way to reduce the employees intention to leave the orgaanization. Mohammad et al. (2011) measured the impact of job satisfaction on OCB. The relationship found between job satisfaction and extra role behavior is significant and positive (Murphy et al., 2002). Job satisfaction is directly related to employee’s OCB. For example, Arif & Chohan (2002) examined the impact of job satisfaction on OCB from 350 employees of banks. Study revealed that there is a direct impact of job satisfaction on employee’s OCB. They further hilighted that job satisfaction casuses 32.6% variations in employee’s extra role behavior. Entrepreneurs’ leadership directly influence employee’s behavior in a positive mannar (Salman et al., 2018: Shabbir et al., 2016:2018). Employees behavior depends on OL (Sani & Maharani, 2012). Entrepreneurial leadership is defined as a mechanism of social influence in which a leader use authority to discribe and direct their subordinates to accomplish organizational goals (Yaffe & Kark, 2011). Helmrich (2016) stated that there is no universal definition of leadership, researcher defined leadership in different perspectives such as Katie Christy defined that leadership is about an individual ability who understand and use his own strenghs as well as his team member’s capacities to achieve the organizational goals. Entrepreneurial leadership is a mechanism through which a leader who organize plans to accomplish a goal through a strategy and influence their follower’s behavior as a whole by directing them to attain organzational mission (Bosma et al., 2011; Kelley et al., 2015). Individuals have not the ability or traits of a leader by birth and similarlily entrepreneurial leadership is not resticted to only one person with in a community or group. Entrepreneurial leadership is a process by which socially a person influence the whole group to achieve a common purpose (Salman et al., 2011). By summarizing all the diverse definitions of entrepreneurial leadership it is concluded that the process of influencing the subordinates who work for a common goal is referred to as entrepreneurial leadership.Entrepreneurial leadership directly influences employee’s behavior which is associated with organizational effectiveness (Suliman & Al Obaidli, 2013). Entrepreneurial leadership is an important element of an organization which has a greater impact on shaping employee’s behavior towards organizational outcomes such as OCB. A leader can recognize the importance of OCB in employees and direct them to perform extra role behavior (Salman et al., 2011; Shabbir, 2009). Entrepreneurial leadership styles positively influence OCB of employees. OCB of employees can positively and significantly be predicted through transactional and transformational entrepreneurial leadership behavior (Rodrigues & Ferreira, 2015). There is a strong relationship between entrepreneurial leadership and stress. Due to stress about 60-80% stressful events occurred at workplace and other health problems are also associated with workplace stress (Seppala & Cameron, 2015). Managerial leadership causes stress in their subordinate at workplace and had a negative impact of employee’s health. Managerial entrepreneurial leadership showed slight impacts on employee’s health and the same generate a low degree of stress in their subordinates (Westerlund et al., 2010). Social cognitive theory can be explained as the basic process of correlation among EL, Stress, and OCB. People evaluate the influences before changing their behavior (Walker & Posner, 2003). Behavior is a complex pschychological pattern, to understand the mechanism of behavioral effect it is necessary to include influencing factors to observe causal system (Bandura et al., 1977). Social cognitive theory has main focus on cognition i.e. self-regulation or selfefficacy. This theory is considered best to understand that how environmental factors or cognition process influence behavior of employees (Lin, 2015). Feelings of tensions or worries, which may be mental, emotional or physical, are referred as stress, interaction between person and environment may also cause stress (Krithika & Robinson, 2016). Therefore, employees stress mediates the impact of leader’s behavior on employee’s behavior to perform OCB. In literature it is stated that behavior of leader has a great impact to change the employee’s responses to exhibit OCB. EL has an ability to change or motivate their employees to involve in extra role behavior (Malik et al., 2016). Theory postulates that there is no direct relationship between response and stimulus, this relationship is mediated through a cognitive process i.e. stress. Therefore, this study supports social cognitive theory by taking stress as a mediator rather than independent variable on the relationship between EL and OCB. Social cognitive theory of Bandura (1986) is the base for this research model. The purpose of this study was to analyze the mediating role of stress on the relationship between EL and OCB. The unit of analysis in this study was employees of entrepreneurial ventures in Iraq. Therefore, the data of an individual level of analysis was carried out. In an economy, SMEs as entrepreneurial ventures are included in top contributor of economic development. The newly established SMEs which are operating in Baghdad region, Iraq were considered for this study. To determine the perception, feelings and evaluation, likert scale was used which also help to identify the respondent’s position to the questions asked to them (Hartley & MacLean, 2006; Gee, 2013). All the items of entrepreneurial leadership were measured with identical rated five point likert scale ranging from 1 (not at all), 2 (once in a while), 3 (sometimes), 4 (fairly often) and 5 (frequently). To measure the items of OCB, stress and SS 5 point likert scale was used with similar rating responses ranging from 1 (strongly disagree), 2 (disagree), 3 (neutral), 4 (agree) and 5 (strongly agree). To measure the OCB of employees, a total of 10 items were adapted from Soo & Ali (2016). Internal relibility of items were 0.86. In the present study OCB was measured unidimensionally. To measure the organizational leaderhip, MLQ were used in the present research. It is stated that MLQ is found to be a good measuring scale of entrepreneurial leadership behavior (Ahmad et al., 2013). Internal reliability of the construct was 0.88. To determine the rate of ocurrence of a stressfull relation between employees and immediate leader measurments were adapted from different surveys such as UCLA SS Inventory. UCLA SS Inventory is adapted several time in past studies (Beal, 1994). To anlyze the degree of stress that an employee face the adopted scale has reliablitiy of 0.91. Generally, if the population is about 100,000 then the sample size will be about 383 at 95% confidence level. This study followed probability sampling as it is necessary to generalize the results (Sekaran & Bougie, 2005). Therefore, researchers used systematic sampling technique to minimize the degree of biasness (Depersio, 2015). Questionnaire was used as a data collection tool and 592 questionnaires were personally distributed among employees of SMEs out of which 359 questionnaires were returned with a response rate of 60. 62%. After ensuring good response rate, the next step was to employ PLSSEM analysis. Reliability and validity are two main criterions which are considered to evaluate the outer model (Tenenhaus et al., 2005). Items reliability and internal consistency were measured using Composite Reliability (CR) with a recommended threshold value of 0.70 (Henseler et al., 2013); and Average Variance Extracted (AVE) with a threshold value of 0.50 and above. Furthermore, indicator’s outer loadings were also calculated (Hans et al., 2015; Gye- Soo, 2016) (Table 1). Variables Items Loadings Cronbach’s Alpha Composite Reliability AVE Discriminant Validity? Note: OCB=Organizational Citizenship Behavior, OL=Entrepreneurial leadership, S=Stress, AVE=Average Variance Extracted. Six items were deleted out of 38 in the analysis of outer model because their outer loading did not meet the suggested threshold level which is greater than 0.5 was met (Wixom & Watson, 2001). Once the reliability and validity of the measurement model were evaluated, the next step was to evaluate the inner model (structural model). First of all collinearity was examined before assessing the structural model (Sarstedt et al., 2014) (Table 2). Note: OCB=Organizational Citizenship Behavior, OL=Entrepreneurial leadership, S=Stress. The proceeding step after confirming the absence for collinearity problem was to assess the structural model. 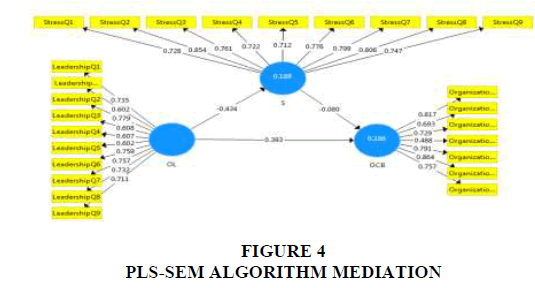 Through, PLS-SEM Algorithm in Smart PLS 3.0, the size of the path coefficients was examined, and then bootstrapping procedure was carried out to assess the significance of the relationship. The analysis of the direct relationship between the independent variable and the dependent variable were focused in first model. A mediating variable of stress was introduced in the second model, and analysis of the relationship between the independent variable EL was examined. The relationship between stress and OCB were then examined. On the basis of PLS-SEM algorithm and bootstrapping procedure, the results were reflected that independent variable (EL) had a positive impact over the dependent variable (OCB). The result suggested that there was a significant relationship between EL and OCB of employees with respect to H1 (β=0.439; t=8.988; p<0.001); therefore, H1 is supported (Table 3). Note: OCB=Organizational Citizenship Behavior, OL=Entrepreneurial leadership, S=Stress, SS=Social Support. The mediating variable was introduced in the second model, and the relationships between EL and stress, as well as stress and OCB, were measured. The path coefficients between EL and stress were negative as shown below in Figure 4 Similarly; the path coefficient between stress and OCB was also negative. In Figure 4 the bootstrapping results showing the relationship was significant with a negative coefficient at p<0.05. The indirect effect of the exogenous variable on the endogenous variable via an intervening variable was assessed in mediation analysis. 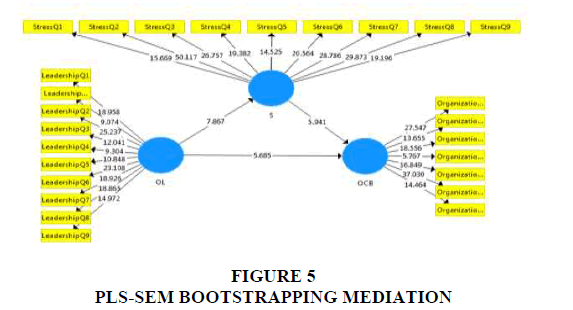 To assess mediation, a causal steps strategy was used in which the product of coefficient method or Sobel test (Tavakoli, 2013) was used. After inclusion of the mediating construct, i.e. stress in model 2, the bootstrapping result of 5,000 subsamples was used to multiply path a and path b. To assess the t-value, the product of the two significant paths (paths a & b) was divided by the product of the standard error of two paths (a*b/Sab). It is, therefore, clear from Table 4 that stress mediated the relationship between EL and OCB (β=0.035; t=3.976; p<0.001). However, Table 4 shows that stress mediate the relationship between EL and OCB (β=0.035; t=8.903; p<0.001). Note: OCB=Organizational Citizenship Behavior, EL=Entrepreneurial leadership, S=Stress. Finally, one interaction term was included. Figure 5 shows that there is a significant addition in the R2 level. The only interaction term is found to be significant as shown in Figure 5. From Table 5 below, it is clear that, the interaction term of EL*SS is found to be significant (β=0.081; t=2.635; p<0.05); therefore, H5 is supported. Coefficient of determination (R2) is one of the most commonly used criterions for assessing the inner model (structural model). From the value of R2, the proportion of variations in the endogenous variable explained by the exogenous variables included in the study was measured. The value of R2 greater than 0.27 (27%) is considered as substantial, if it is greater than 0.13 than moderate and the value of R2 is less than 0.02 than it indicates week R2 value (Strub & Cieszewski, 2012; Nakagawa & Schielzeth, 2013). From Figure 5 above values of R2 reported in Table 6 below. From the Table 6 it is clear that the independent variable (EL) explain only 19% variations in the mediating variable (stress). While, value of R2 in the table indicates that 46% variations in the endogenous variable (OCB) explained by the three exogenous variable (OL, and stress) combined in the model. Hence, it is concluded on the bases of above results of assessments of R2 of endogenous variable EL behavior (46%) and stress (19%), which demonstrate that the predictive validity of model is moderate to substantial. In the present study, the gaps of preceding studies were addressed in order to advances the understanding of the observed phenomenon, such as: (i) the inclusion of stress (negative emotions) as mediator that intervenes between EL and OCB, and (iii) the use of the mediator in a single model. Altogether, by using the technique of PLS-SEM to determine the overall impact of EL behavior on OCB, present study aimed at contributing in the OCB literature by providing empirical evidence. A comprehensive analysis of the effects of EL on OCB was developed through PLS-SEM data analysis approach. This study has highlighted some interesting findings. Firstly, findings of the study revealed that stress mediates between EL and OCB and provide a foundation for future research to investigate the relationship between EL and OCB with the inclusion of potential negative emotions of employees as a mediator that serve as barriers. Keeping the findings of this paper in view, the benefits of organizational citizenship behavior can be viewed in productivity, efficiency, reduced costs, customer satisfaction, and unit level turnover and organizational effectiveness. This may be helpful for policy makers to consider these consequences which may contribute to the organizations to gains Competitive advantage. Organizations may Sustain Competitive Advantage through sustaining the OCB among the employees of the Organization. Such findings of the present study open new avenues for future exploration to investigate other forms of support. Finally, the whole study provides a comprehensive assessment of the relationship between all the variables which were considered in the present study. In this study all the variables were measured as a uni-dimensionally. So, the future studies can consider assessing by looking at the dimensions that how they exclusively affect the relationship of EL and OCB. Multi-dimensionality of constructs would provide an in-depth understanding of the nature of the relationship. Therefore, this study suggests that future studies should further consider multidimensionality of the variables. Agarwal, S. (2016). Organizational citizenship behavior: A comparative study between public and private sector bank. International Journal of Engineering Technology. Management and Applied Sciences, 4(5), 161-166. Ahmad, A.R., Adi, M.N.M., Noor, H.M., Rahman, A.G.A., & Yushuang, T. (2013). The influence of leadership style on job satisfaction among nurses. Asian Social Science, 9(9), 172. Ahmed, I., Ramzan, M., Mohammad, S.K., & Islam, T. (2011). Relationship between perceived fairness in performance appraisal and ocb; mediating role of organizational commitment. International Journal of Academic Research, 3(5). Ali, N.N.K., & Tang, S.Y. (2016). Does multiple leadership styles mediated by job satisfaction influence better business performance? Perception of MNC employees in Malaysia. In SHS Web of Conferences, EDP Sciences. Ali, U., & Waqar, S. (2013). Teachers’ organizational citizenship behavior working under different leadership styles. Pakistan Journal of Psychological Research, 28(2). Alkahtani, A. (2015). Organizational citizenship behavior (OCB) and rewards. International Business Research, 8(4), 210. AlKerdawy, M.M.A. (2014). 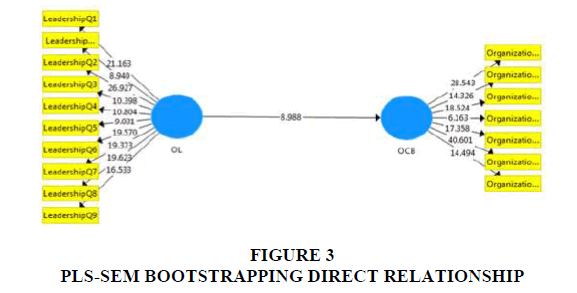 The mediating effects of duty orientation on the relationship between perceived organizational support and organizational citizenship behavior in the public banks of Egypt. International Journal of Business and Management, 9(8), 155. Andersen, H. (2016). Laissez-faire leadership in the Armed Forces and consequences for the psychosocial working environment. Unpublished doctoral dissertation, Defense College. Anjum, A., Sabir, H.M., & Khaliq, T. (2016). Impact of organization trust, organization justice and job satisfaction on organization citizenship behavior: A study in banking sector of Pakistan. International Journal of Academic Research in Business and Social Sciences, 6(12), 630-643. Arif, A., & Chohan, A. (2012). How job satisfaction is influencing the organizational citizenship behavior (OCB): A study on employees working in banking sector of Pakistan. Interdisciplinary Journal of Contemporary Research in Business, 4(8), 74-88. Bandura, A. (2009). Social cognitive theory of mass communication. Media effects. Routledge. Bandura, A., Adams, N.E., & Beyer, J. (1977). Cognitive processes mediating behavioral change. Journal of Personality and Social Psychology, 35(3), 125. Beal, L.M. (1994). Burnout, social support, and coping in crisisline volunteers. Bosma, N., Wennekers, S., & Amorós, J. E. (2011). Entrepreneurs and entrepreneurial employees across the globe 2011 extended report: Entrepreneurs and entrepreneurial employees. Deb Chowdhury, D. (2013). Organizational citizenship behavior towards sustainability. Dilawar, I. (2016). Pakistan banking awards 2016: UBL declared the best bank of Pakistan. Business Recorder. Eatough, E.M., Chang, C.H., Miloslavic, S.A., & Johnson, R.E. (2011). Relationships of role stressors with organizational citizenship behavior: A meta-analysis. Journal of Applied Psychology, 96(3), 619. Faisal, M., Shabbir, M.S., Javed, S., & Shabbir, M.F. (2016). Measuring service quality and customer satisfaction in Pakistan: Evidence based on CARTER Model. International Business Management, 10(20), 5011-5016. Gye-Soo, K. (2016). Partial least squares structural equation modeling (PLS-SEM): An application in customer satisfaction research. European Bussiness Review, 26(2). Hadi, T. (2016). Banking Survey 2015 commercial banks operating in Pakistan. Karachi: KPMG International Cooperative. Hair, J.F., Ringle, C.M., & Sarstedt, M. (2013). Partial least squares structural equation modeling: Rigorous applications, better results and higher acceptance. Hans, A., Mubeen, S.A., & Al-Badi, A.H.H. (2015). Antecedents of organizational citizenship behavior (OCB) in banking sector of sultanate of Oman. International Journal in Management & Social Science, 3(1), 152-164. Hartley, S.L., & MacLean Jr, W.E. (2006). A review of the reliability and validity of Likert‐type scales for people with intellectual disability. Journal of Intellectual Disability Research, 50(11), 813-827. Hasan, H.A. (2013). Promoting organizational citizenship behavior among employees-the role of leadership practices. International Journal of Business and Management, 8(6), 47. Henseler, J., Dijkstra, T.K., Sarstedt, M., Ringle, C.M., Diamantopoulos, A., Straub, D.W., Ketchen, D.J., Hair Jr, J., Hult, T.M., & Calantone, R.J. (2014). Common beliefs and reality about PLS: Comments on Rönkkö and Evermann (2013). Organizational Research Methods, 17(2), 182-209. Iqbal, J., Shabbir, M.S., Zameer, H., Khan, I.A., & Sandhu, M.A. (2017). Antecedents and consequences of employee engagement: Evidence from corporate sector of Pakistan. Paradigms, 11(1), 78. Jafari, H., Sadeghi, A., & Zarnagh, R.K. (2011). The relationship between organizational citizenship behavior and organizational commitment in hasheminezhad hospital. Journal of Health Sciences, 3(1), 52-61. Jafari, P., & Bidarian, S. (2012). The relationship between organizational justice and organizational citizenship behavior. Procedia-Social and Behavioral Sciences, 47, 1815-1820. Jain, A.K., Giga, S.I., & Cooper, C.L. (2013). Perceived organizational support as a moderator in the relationship between organisational stressors and organizational citizenship behaviors. International Journal of Organizational Analysis, 21(3), 313-334. Kelley, D., Singer, S., & Herrington, M. (2015). Global Entrepreneurship Monitor-2015/2016. Global Report. Khan, N. R., Ghouri, A. M., & Awang, M. (2013). Leadership styles and organizational citizenship behavior in small and medium scale firms. Kiran, M.R., & Salman, S. (2011). How leaders Overturn organizational learning? Konovsky, M.A., & Pugh, S.D. (1994). Citizenship behavior and social exchange. Academy of Management Journal, 37(3), 656-669. Krithika, R.A., & Robinson, M. (2016). A study on occupational stress among the women employees in banking sector at Trichy district. International Journal, 2, 817-820. Lian, L.K., & Tui, L.G. (2012). Leadership styles and organizational citizenship behavior: The mediating effect of subordinates’ competence and downward influence tactics. Journal of Applied Business and Economics, 13(2), 59-96. Lin, H.C. (2016). Impact of nurses’ cross‐cultural competence on nursing intellectual capital from a social cognitive theory perspective. Journal of Advanced Nursing, 72(5), 1144-1154. Lyons, J.B., & Schneider, T.R. (2009). The effects of leadership style on stress outcomes. The Leadership Quarterly, 20(5), 737-748. Malik, S.Z., Saleem, M., & Naeem, R. (2016). Effect of leadership styles on organizational citizenship behavior in employees of telecom sector in Pakistan. Pakistan Economic and Social Review, 54(2), 385. Malott, M.E. (2016). Selection of business practices in the midst of evolving complexity. Journal of Organizational Behavior Management, 36(2-3), 103-122. Mohammad, J., Quoquab Habib, F., & Alias, M.A. (2011). Job satisfaction and organizational citizenship behavior: An empirical study at higher learning institutions. Asian Academy of Management Journal, 16(2). Mohammad, J., Quoquab Habib, F., & Alias, M.A. (2011). Job Satisfaction and Organizational Citizenship Behaviour: An Empirical Study at Higher Learning Institutions. Asian Academy of Management Journal, 16(2). Murphy, G., Athanasou, J., & King, N. (2002). Job satisfaction and organizational citizenship behaviour: A study of Australian human-service professionals. Journal of Managerial Psychology, 17(4), 287-297. Nakagawa, S., & Schielzeth, H. (2013). A general and simple method for obtaining R2 from generalized linear mixed‐effects models. Methods in Ecology and Evolution, 4(2), 133-142. Nguni, S., Sleegers, P., & Denessen, E. (2006). Transformational and transactional leadership effects on teachers' job satisfaction, organizational commitment, and organizational citizenship behavior in primary schools: The Tanzanian case. School Effectiveness and School Improvement, 17(2), 145-177. Ozbay, F., Fitterling, H., Charney, D., & Southwick, S. (2008). Social support and resilience to stress across the life span: a neurobiologic framework. Current Psychiatry Reports, 10(4), 304. Ozbay, F., Johnson, D.C., Dimoulas, E., Morgan III, C.A., Charney, D., & Southwick, S. (2007). Social support and resilience to stress: from neurobiology to clinical practice. Psychiatry (Edgmont), 4(5), 35. Podsakoff, P.M., MacKenzie, S.B., Paine, J.B., & Bachrach, D.G. (2000). Organizational citizenship behaviors: A critical review of the theoretical and empirical literature and suggestions for future research. Journal of Management, 26(3), 513-563. Rodrigues, A.D.O., & Ferreira, M.C. (2015). The impact of transactional and transformational leadership style on organizational citizenship behaviors. Psico-USF, 20(3), 493-504. Rowe (2007). Entrepreneurial leadership-What is it? Saif-Ud-Din, M.I., & Adeel, M. (2016). Investigating the relationship of organizational citizenship behavior with job satisfaction, organizational commitment and turnover intention: Evidence from the banking sector of Pakistan. Global Journal of Management and Business Research. Salman, R., Arshad, D., Bakar, L., & Shabbir, M. (2018). The effect of innovative cultural processes on performance of small and medium size enterprises. Management Science Letters, 8(10), 1039-1048. Salman, R., Shabbir, M.F., Shabbir, M.S., & Hafeez, S. (2011). The role of leadership in developing an ICT based educational institution into learning organization in Pakistan. International Journal of Academic Research in Business and Social Science, 1(SI), 212-226. Sani, A., & Maharani, V. (2012). The impacts of transformational leadership and organizational commitment on job performance with the among lecturers of faculty in the Islamic Maulana Malik Ibrahim Malang University: The mediating effects of organizational citizenship behavior. International Journal of Academic Research, 4(4), 102-106. Sargent, L.D., & Terry, D.J. (2000). The moderating role of social support in Karasek's job strain model. Work & Stress, 14(3), 245-261. Sarstedt, M., Ringle, C.M., Smith, D., Reams, R., & Hair Jr, J.F. (2014). Partial least squares structural equation modeling (PLS-SEM): A useful tool for family business researchers. Journal of Family Business Strategy, 5(1), 105-115. Seppala, E., & Cameron, K. (2015). Proof that positive work cultures are more productive. Harvard Business Review, 12. Shabbir, M.S. (2009). Supportive learning environment-A basic ingredient of learning organization. Proceedings 2nd CBRC, Lahore, Pakistan. Shabbir, M.S., Shariff, M.N.M., & Shahzad, A. (2016). A conceptual development of entrepreneurial skills and entrepreneurial intentions: A case of IT employees in Pakistan. International Journal of Academic Research in Business and Social Sciences, 6(3), 65-78. Shabbir, M.S., Shariff, M.N.M., Kiran, R., Faisal, M., & Shahzad, A. (2016). Cyber entrepreneurship: A note on indigenous perspective from a developing country. The Social Sciences, 11(5), 704-709. Shabbir, M.S., Shariff, M.N.M., Yusof, M.S.B., Salman, R., & Hafeez, S. (2018). Corporate social responsibility and customer loyalty in Islamic banks of Pakistan: A mediating role of brand image. Academy of Accounting and Financial Studies Journal. Sherman, G.D., Lee, J.J., Cuddy, A.J., Renshon, J., Oveis, C., Gross, J.J., & Lerner, J.S. (2012). Leadership is associated with lower levels of stress. Proceedings of the National Academy of Sciences, 109(44), 17903-17907. Soo, H.S., & Ali, H. (2016). The linkage between stress and organizational citizenship behavior. International Business Management, 10(14), 2713-2718. Strub, M., & Cieszewski, C. (2012). The comparative R2 and its application to self-referencing models. Mathematical and Computational Forestry & Natural-Resource Sciences (MCFNS), 4(2), 73-76. Suliman, A., & Al Obaidli, H. (2013). Leadership and organizational citizenship behavior (OCB) in the financial service sector: The case of the UAE. Asia-Pacific Journal of Business Administration, 5(2), 115-134. Sunita, Singh, U., Singh, S., & Sharma, R. (2015). Work stress and organisational citizenship behaviours (OCBs) in call centers employees. The International Journal of Indian Psychology, 3(1), 10-14. Tavakoli, A.S. (2013). Examining mediator and indirect effects of loneliness in social support on social well-being using Baron and Kenny and a Bootstrapping Method. Tenenhaus, M., Vinzi, V.E., Chatelin, Y.M., & Lauro, C. (2005). PLS path modeling. Computational Statistics & Data Analysis, 48(1), 159-205. Troena, E.A., & Noermijati, N. (2013). Organizational citizenship behavior role in mediating the effect of transformational leadership, job satisfaction on employee performance: Studies in PT bank Syariah Mandiri Malang east Java. International Journal of Business and Management, 8(17), 1. Walker, G., & Posner, A. (2003). Using social cognitive theory to predict behavior. Journal of Undergraduate Research at Minnesota State University, Mankato, 3(1), 7. Westerlund, H., Nyberg, A., Bernin, P., Hyde, M., Oxenstierna, G., Jäppinen, P., Vaananen, A., & Theorell, T. (2010). Managerial leadership is associated with employee stress, health, and sickness absence independently of the demand-control-support model. Work, 37(1), 71-79. Williams, S., Pitre, R., & Zainuba, M. (2002). Justice and organizational citizenship behavior intentions: Fair rewards versus fair treatment. The Journal of Social Psychology, 142(1), 33-44. Wixom, B. H., & Watson, H. J. (2001). An empirical investigation of the factors affecting data warehousing success. MIS Quarterly, 17-41. Yaffe, T., & Kark, R. (2011). Leading by example: A case of leader OCB. Journal of Applied Psychology, 1-21.